We all know the story of baby Moses in the bulrushes. It is a familiar story. But sometimes the more familiar something is, the less likely we are to think deeply about it. I believe that we can learn some valuable lessons about the process of relinquishing control and trusting God with our children from this story about a baby boy and his mother. When we read Exodus 2:1-10, we tend to do so with a focus on Moses as the main character. But what if we were to read it with a slightly different focus? What if we looked at it from his mom’s point of view? We know from other places in Scripture that Moses’ mother’s name was Jochebed. She was a descendent of Levi and the mother of Moses, Aaron and Miriam. We also know that she was a brave, faith-filled woman. Here’s the passage. Let’s read it again – this time through a mother’s eyes. At this point in history, the Israelite people had been enslaved in Egypt for almost 400 years. They had become so numerous that they were considered to be a threat to national security. So a decree was issued that all Hebrew newborn boys were to be thrown into the Nile River. This is the environment into which Moses was born. While most women of that time period prayed for a son to bring them honor and security in their old age, Hebrew women all over Egypt were likely begging God for a daughter, not a son. But Jochebed had a boy. And the Bible tells us that he was a fine baby boy. She did all that she could to protect him from the harsh world into which he was born. When she was no longer able to hide him, she made what was probably the hardest decision of her life: to turn him over to the hands of her Lord. 1. She kept him safe while she could. Jochebed hid Moses for three months, doing whatever was in her power to keep him safe. As parents, we all know that it is our duty to keep our children safe – physically and emotionally. We keep them safe emotionally by accepting them for who they are, nurturing them and disciplining them with love and compassion. 2. She prepared for his release into God’s hands. Jochebed planned ahead. She knew what she had to do and she knew how she would do it. She made his release as safe as possible, lining the basket with tar and pitch. When it comes time to release our children, we too need to prepare. Our “tar and pitch” includes spiritual and moral guidance, equipping with godly wisdom, creating a foundation of faith and pointing them to the Savior every chance we get. 3. She trusted God and let him go. The moment Jochebed put the basket in the Nile and turned away must have been the hardest thing she ever did. She relinquished control of her precious baby. She let him go. Standing on this side of history, we know how the story ends. But when Jochebed left him in that river, the story was still unwritten. 4. She allowed temporary discomfort. Moses was not happy about being in that basket. Scripture tells us that he was crying when Pharaoh’s daughter found him. Everything in Jochebed must have wanted to rescue him but she didn’t. Do we let our children experience teachable hardships? Do we jump in and rescue before God can teach them what He wants them to learn? 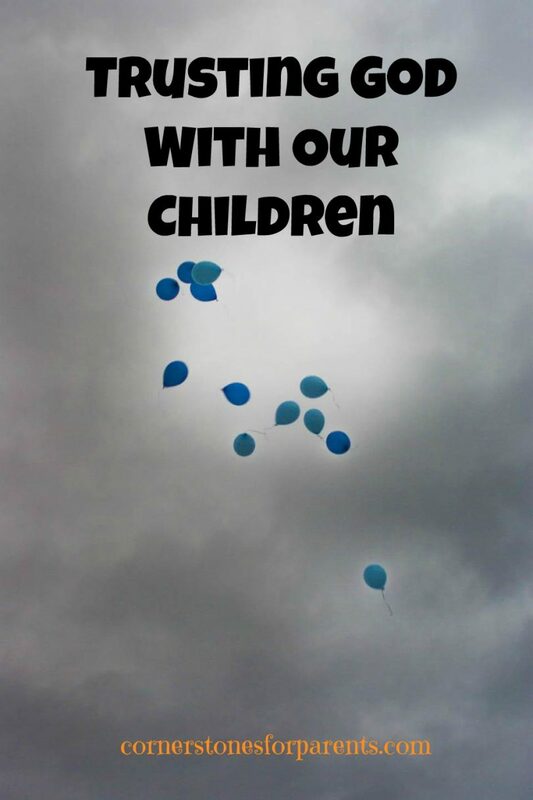 We do our children a disservice if we protect them too much. We rob them of the opportunity to learn coping skills as well as first-hand the great redemptive power of their God. 5. God blessed her. It was after she gave up control that she was blessed by God. Her faith and trust in Him led to a blessing far greater than she likely imagined. God is in the business of creating beauty from ashes and answering prayers in ways that only He can. Letting our children go in any form is scary – often to a point that we choose other options. But if we cling too tightly, we may miss out on the blessing of seeing God work in amazing and powerful ways. We would do well to remember Romans 8:28 – In all things God works for our good. The good news is that we will never be faced with the situation that Jochebed faced. But there are launching opportunities throughout our children’s growth – big and small. Time and time again, God proves that He is faithful and trustworthy – let’s let Him prove it with our children. Thank you so much for your encouraging comment. I am so thankful and humbled that God is using it for His purposes in your life. Thank you for taking the time to share your heart with me. Hi Laura, thank you so much for your valuable parenting insights through the experiences of Jochebed. ‘Was truly informative as well as a blessing. Hi Jimmy – You are most welcome. 🙂 Thanks for stopping by!